Greig Laidlaw scored 22 points as Gloucester made it four wins out of four in the European Challenge Cup with victory over Worcester at Kingsholm. After Laidlaw and Ryan Lamb exchanged early penalties, Ben Howard ran in a fine try to give Warriors the lead. 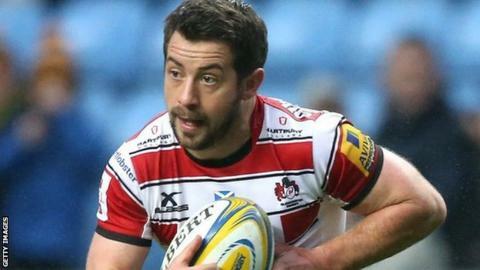 Scotland scrum-half Laidlaw scored a try either side of two penalties to give Gloucester a 16-10 half-time lead. Former Worcester back row Matt Kvesic was bundled over after another couple of Laidlaw penalties to seal the win. Warriors, who lost the reverse fixture at Sixways 34-22 a week earlier, sit bottom of Pool Four with just one victory from their opening four games. A young Worcester side showed dogged defence throughout but were undone as the boot of Laidlaw, capped 46 times by his country, proved instrumental. The visitors got off to an ideal start as Andy Symons found some space and offloaded to Howard, who raced 40 metres before crossing the whitewash. However, Laidlaw ran in unopposed after Jonny May chased his own kick and teed him up, the England winger biding his time after reclaiming the ball at a ruck before finding the supporting scrum-half with the perfect pass. Kvesic, who moved south from Sixways in 2013, then touched down from the bottom of a driving maul to make sure there was to be no Worcester comeback. "We're delighted to be coming into Christmas top of the pool with four wins out of four. "The nature of the performance was probably indifferent, we struggled to get the quick ball we needed - on that sort of surface it was very hard to create space, so you've got to beat teams round the corner and we couldn't do it. "Credit to Worcester, I thought they defended very strongly and caused us problems at the breakdown - so we'll have a look at that, but we know going into the next round of games that's going to be an important aspect of competing against some of the bigger teams." Gloucester: Cook; Sharples, Purdy, Twelvetrees (c), May; Hook, Laidlaw; Yann Thomas, Dawidiuk, Nicky Thomas; Savage, Galarza; Rowan, Kvesic, Ludlow. Replacements: Lindsay, Murphy, McNulty, Stooke, Hicks, Heinz, Burns, Atkinson. Worcester: Howard; Hammond, Grove, Symons, Biggs; Lamb, Mulchrone (c); Ruskin, Sowrey, Daniels; Sanderson, Cavubati; Betty, Kirwan, Mama. Replacements: Bregvadze, Bower, Milasinovich, Barry, Taylor, Arr, Eden, Stelling.